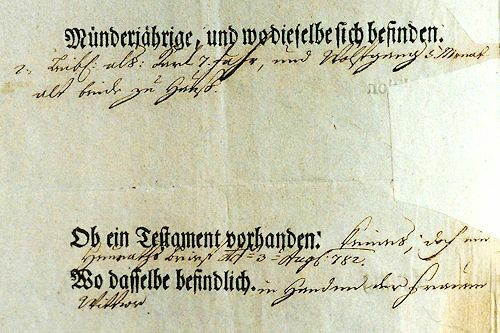 Michael Lorenz: Mozart Documents "transcribed"
Deutsch's transcription of the above text concerning Mozart's two minor children – note that Franz Xaver was already called "Wolfgang" as an infant – and the existence of a will or a comparable legal document (such as a marriage contract) is a fine example of one of his countless palaeographical failures. Deutsch begins the transcription of the first handwritten passage as follows: "2[!] Bübl:[sic] als: Karl 7. Jahr". The word "Bübl" (boys), which was never used by a Sperrskommissär, is of course complete nonsense. The entry reads "Leibl:[iche]" (legitimate [children]). The next entry is garbled by Deutsch the following way: "Keines,[!] doch ein Heuraths Brief Act = 3 = Aug: 782." This is a true monument of ignorance. One could accept the missing semicolon, but any serious scholar who has ever worked with eighteenth-century Viennese administrative documents, can recognize and transcribe the abbreviation "dd°" (with the small superscript "o" being doubly underlined) which means "de dato" (i.e. dating from). And the second one of Deutsch's absurd double dashes is simply the double underscore of the superscript abbreviation "t[er]", belonging to the "3" which is the date of Mozart's marriage contract. Mistakes of such grotesque scale in a volume of the Neue Mozart-Ausgabe, which is supposed to represent a final and authoritative edition of the sources, are simply breathtaking. And the situation becomes even more absurd given the fact that this document had been published several times in a much less flawed (and "Bübl"-less) version, decades before Deutsch dealt with it. Arthur Schurig published part of the Sperrs=Relation in his book Constanze Mozart: Briefe, Aufzeichnungen, Dokumente 1782 bis 1842, (Dresden 1922) and published it a second time in the 2nd edition of his book Wolfgang Amadeus Mozart. Sein Leben, seine Persönlichkeit, sein Werk, (Leipzig 1923). Albert Leitzmann also published (much less flawed) excerpts from this document in his collection Wolfgang Amadeus Mozart. Berichte der Zeitgenossen und Briefe, (Leipzig 1926). The funniest detail is that Deutsch was fully aware of these earlier publications. He refers to them in his commentary at the end of his own transcription where he proudly points out that "contrary to all the earlier editions this one is complete" – which of course it is not. The story does not end here. For several years now the Mozarteum has been working on a project titled "Briefe und Aufzeichnungen zu W. A. Mozart und seiner Familie aus den Beständen der Stiftung Mozarteum Salzburg". The goal of this project, which is being funded the Packard Humanities Institute, Los Altos/California, is the online publication of all letters and documents related to the Mozart family as well as related letters and documents spanning from 1740 (when Leopold Mozart arrived in Salzburg ) to 1881 (the founding of the International Mozarteum Foundation). The list of hitherto published documents provides a fascinating glimps into the blissfully complacent world of the Mozarteum. The online publication of the documents is marred by several problems and a literal ocean of mistranscriptions awaits the interested reader. Many of these hidden howlers are true gems and the fun they provide almost lets one forget that this kind of dilettantism is draining huge amounts of money away from scholarship that could put generous funding to a much better use. 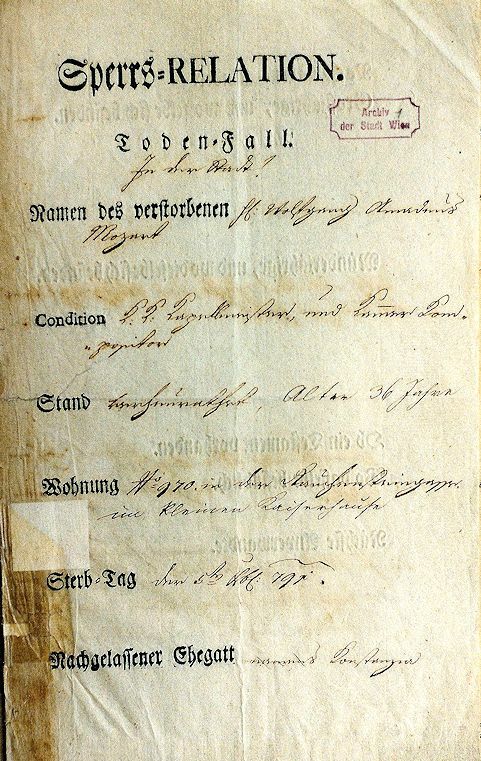 Note for instance the poor "Frau Schupfer" in this document who was recklessly turned into a "Frau Söhupfer", because none of the people in charge know how a small "c" is written in Kurrentschrift. The transcriptions that appear beside the pictures apply a ridiculously unpractical set of "Kürzel" signs (the Mozarteum calls them "Abbreviatur-Schleifen") instead of bracketed completions of the words which sometimes turn the reading of these transcriptions (such as Mozart's letter of 27 March 1770 from Bologna) into a mind-boggling experience. 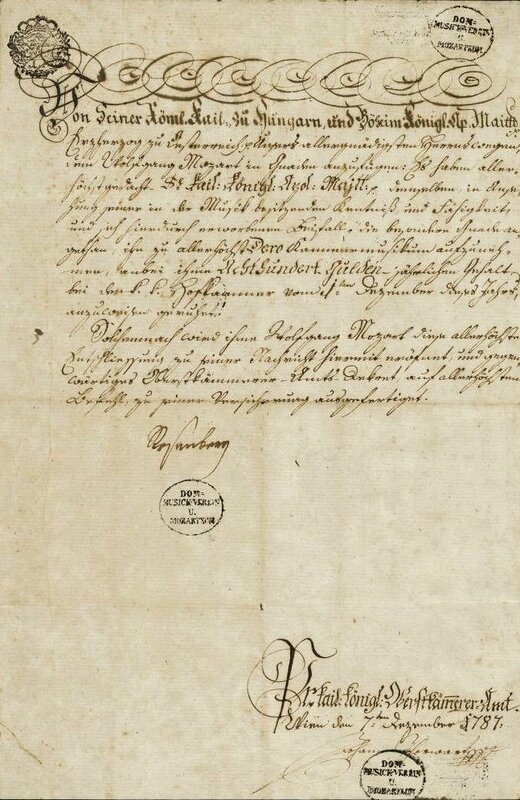 The fact that some transcriptions contain the term "unleserlich" (illegible) is all the more frustrating, considering the small size and the weak resolution of the pictures that make it impossible for the reader to decipher the document on his own. What kind of transcription of this document does David Woodley Packard get for his money? It turns out that the text of this decree, as presented on the Mozarteum website, is neither new nor is it flawless. The money was new and flawless alright, but the transcription is an exact copy right out of Deutsch's flawed 1961 edition of the Mozart-Dokumente. All the typical symptoms of Deutschian perplexity are still there: the Mozarteum's transcriber (or rather copier) does not resolve the abbreviations (not even in the print version), still mistakes the "p." at the end of the headline for an "etc. ", and the meaning of "Pr." at the beginning of the closing formula is still a mystery. Needless to say that this document has also been published several times by Jahn, Schurig, Tenschert and Müller von Asow. Sometimes even in better readings. So pleased you're using your blog to bring all this stuff to our attention. "Blissfully complacent world" puts it very well, indeed. It's a pity to see old (and sometimes also new) mistakes being spread out by the Mozarteum although they should know better. 1. I can't make much sense of ‹ter› here. Is the doubly-underlined superscript ‹t› perhaps abbreviating the ending of ‹3ten›, as often seen in Mozart's letters? 2. Thorwart was at the wedding not I think as Mozart's best man, but as Constanze's legal guardian to give her away on behalf of her deceased father. 3. It's nice to see that Constanze doesn't have to take all the blame any more for the crippling appellation "Wolfgang Amadeus Mozart II". She does however have to take a lot of the blame for the Mozarteum. Constanze's legal guardian was the Obersthofmarschall whom Thorwarth was in no position to represent. Nothing is as effective as scientific historiography for healing the deliberate blindness, disciplining the chronic laziness and cleaning the dirty ears of cultural officialdom and their hangers-on.